On April 4, the East Japan Railway Company reported progress in the development of the world's first fuel cell-powered train. With the prototype nearing completion, the company announced plans to begin trial runs in order to collect data before putting the train into commercial service. According to officials, the test train consists of one car and is powered by two 65kW fuel cells that enable speeds of up to 100 kph (60 mph). 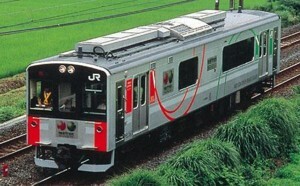 The train is an upgraded version of JR's New Energy (NE) train -- an experimental diesel-electric hybrid developed in 2003 -- whose diesel generator has been replaced with fuel cells. The new fuel cell-powered NE train is scheduled to begin service in the summer of 2007 on the rural, non-electrified Koumi Line in Nagano and Yamanashi prefectures. Hydrogen stored in a tank aboard the train is supplied to the fuel cells, where it reacts with oxygen to produce electricity. Unused electricity and electricity generated during braking is stored in a secondary battery, which is used as an auxiliary power source. In addition to being energy-efficient, hydrogen fuel cells emit no carbon dioxide (a contributor to global warming), only water.